Marianne Prowse was born in Teignmouth on 11 January 1798. She was the eldest daughter of William and Margaret Jeffery and had one sister, Sarah Frances. While the specific address of the Jefferys’ residence cannot be verified, a letter from John Keats to his friend John H Reynolds places the family at ‘35, The Strand’. In 1817, Marianne and her family became acquainted with George and Tom Keats, who had moved to 20, The Strand (now known as Northumberland Place). In that year, the two brothers became close friends with the Jeffery family, and Marianne is documented as having nursed Tom during a period of sickness. It is through Marianne’s acquaintance with George and Tom that she became associated with their older brother, the poet and writer John Keats. ‘How do you like John? Is he not very original? He does not look by any means so handsome as four months ago, but is he not handsome? I am sure that you must like him very much, but don’t forget me’. This was the beginning of Marianne’s acquaintance with John Keats: a significant event, since she allegedly fell in love with the poet. After Keats’s departure from Teignmouth in the spring of 1818, he lost contact with Marianne and her sister for just under a year, but reopened communication with them through a letter sent on 31 May 1819, which inquired about inexpensive lodgings in Teignmouth. As none of Prowse’s letters to Keats have survived, historians must rely on the letters written by Keats—which indicate that Prowse earnestly sent him numerous letters—as proof of her respect and affection for the poet. Critic Graham-Campbell suggests a reciprocal affection: ‘His two letters of 1819 show Keats writing to a woman of understanding, both when it came to personal difficulties and to literary matters’. However, while there may be evidence of mutual affection, Keats showed no interest in having a deeper involvement with her. On 21 June 1829, Marianne Jeffery married Isaac Sparke Prowse, a wine merchant in nearby Kenton. They had one child, William Jeffery Prowse who later became a writer of comic verse. In 1830 she published her first and only collection of poems under her married name, Mrs. I.S. Prowse. The book was well received by the public and had a considerable list of subscribers from across the country. This collection of poems contains themes preoccupied with nature and impending disaster and also serves as evidence of a significant connection between Marianne and Keats. Many of the poems within the collection use literary techniques similar to Keats’s poetical style: one such poem, ‘Ada’, employs a ‘juxtaposition of opposites’, which is a characteristic of Keats’s poetry. The book of poems also supports the theory that Marianne was potentially the ‘mysterious Teignmouth benefactor’ of Keats, who sent a sonnet (‘Star of high promise – not to this dark age’) and twenty-five pound note to the poet in November 1819 under the alias of “P. Fenbank”. 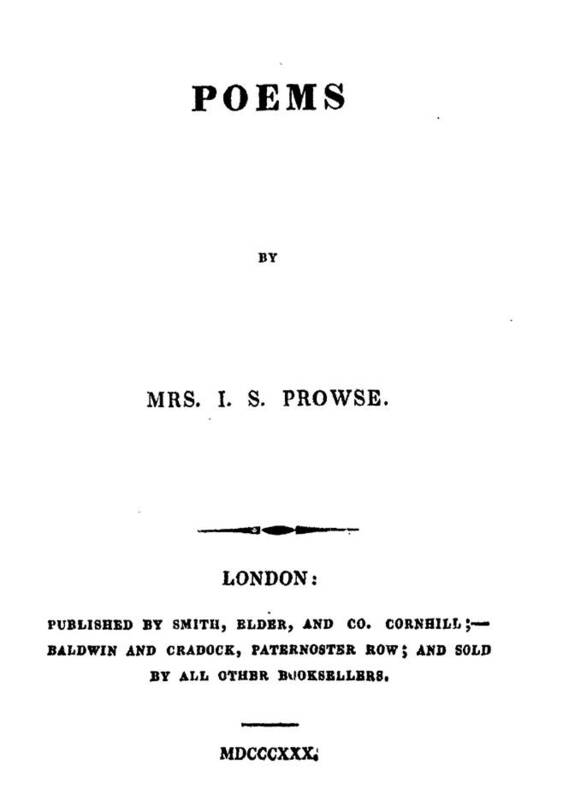 Marianne Prowse died of ‘debility’ in Torquay on 13 January 1850. The New Brunswick Literary Encyclopedia …..